Frustratingly the only copy I have ever been able to find of Vetrimaaran’s debut film is a relatively poor quality VCD that doesn’t have English subtitles. It’s particularly annoying knowing how well written the dialogues were in Aadukalam (even via subtitles) and I’m sure there is much I have missed in Polladhavan as a result of not understanding the language. However the story is still clear and easy to follow, with plenty of scenes that suggest a similar attention to developing the flawed characters and their relationships as in Vetrimaaran’s subsequent film. Although there is much that initially seems familiar about the story, as the film progresses it breaks away from the typical gangster film mould and becomes as much about family as the struggle between Prabhu (Dhanush) and the gangsters who have stolen his beloved motorbike. There is plenty of tension and suspense, and the path to the final bloody showdown is rather more convoluted than expected. It’s a good story, entertainingly told and really deserves to be more readily available to a wider audience. Dhanush appears in his by now very familiar role as Prabhu, an unemployed layabout, content to spend his days playing carom and hanging out with his friends Kumar (Karunas) and Sathish (Santhanan) or annoying the local bike dealers by repeatedly viewing a Pulsar motorbike. He has no hope of ever being able to afford the object of his desire but continually attempts to get a cheaper price along with a long instalment plan for payment and seems convinced that he will one day be the proud owner of the latest model. Nothing wrong with having a dream! Prabhu is at odds with his father (Murali) who wants him to get a job, but is supported by his mother (Bhanupriya) who slips him money behind her husband’s back. There are the usual family arguments about money and Prabhu’s failure to contribute to the household, but things change after Prabhu confronts his father following a drunken night out. Prabhu accuses his father of not supporting his attempts to find work compared to his friends whose fathers who have paid bribes or bought them a start in their chosen career. Although this seems a very strange argument to me, it strikes a nerve with Prabhu’s father and he cashes in the money set aside for his daughter’s wedding and gives it to Prabhu instead. Naturally Prabhu immediately goes and buys the bike. What is interesting is the way this argument and Prabhu’s subsequent purchase of the motorbike change the family dynamic. While Prabhu’s mother accuses him of wasting the money, Prabhu’s father supports his son’s right to do whatever he chose, even if he doesn’t agree with that choice. The family arguments feel realistic and plausible and Prabhu’s conviction that his bike will help him get a job seems typical of any young man in similar circumstances. Body language is key and Vetrimaaran uses different angles and distance shots to convey the changing relationships. It helps give the film an authentic sense of a typical family which makes the subsequent scenes of violence a complete and striking contrast. Amazingly Prabhu’s purchase has the desired result and he manages to get a job, further aiding his reconciliation with his father. The development of their relationship is shown in small moments such as when his father chases away the neighbourhood children playing on the bike, or by his father’s smile when he sees job adverts circled in the newspaper. It’s effective and develops relationships while avoiding a big family make up scene that would only have interrupted the flow. As well as dreaming about owning a motorbike, Prabhu has spent the last 2 years infatuated with a girl he sees at the local bus stop. The bike and his job give Prabhu the confidence to finally approach Hema (Divya Spandana) and after a shaky start the two begin a relationship. However, after a good beginning with plenty of humour and promising signs of a personality for Hema, once the action ramps up the romance is relegated to the background with Prabhu’s first love (his motorbike) taking precedence in the story. As things are going well for Prabhu, in a semi-parallel storyline local gangster Selvam (Kishore) has problems with his younger brother Ravi (Daniel Balaji). Selvam deals in drugs and is involved in various other illegal activities as he runs his area with help from his best friend Out (Pawan). Ravi wants a bigger role in his brother’s endeavours despite his quick temper and apparent general unsuitability for any responsibility. Prabhu crosses paths with Ravi a few times in chance encounters, but most notably on a night when the gang is involved in a murder and Prabhu’s bike is stolen. The two events may, or may not be connected but Prabhu really doesn’t care – he just wants his bike back! Some of the best scenes occur when Prabhu’s search takes him to different crime operations with a fascinating look at how bikes can be hidden and smuggled around the country. These brushes with the shady side of Chennai bring Prabhu into closer contact with Selvam and his brother Ravi, and the situation escalates as Prabhu discovers exactly what has happened to his bike. Dhanush gets everything just right here in his portrayal of a young man gradually developing maturity and responsibility but easily distracted by events around him. His spiral into violence is clearly shown as a reaction to circumstance with the infatuation with his bike a convincing reason for the decisions he makes. I had friends who were just as obsessed with their bikes (and I have to confess to a certain amount of obsession with my own!) so it totally makes sense to me that Prabhu would go to such extremes to get his bike back. Ravi is a more typical Tamil film gangster, but his brother Selvam is an interesting character who seems to be a ‘gangster with a conscience’. The interplay between Ravi, Selvam and Out is well done, and once Prabhu is added in to the mix, the story evolves quickly with plenty of suspense thrown in for good measure. The final scenes revert to more typical gangster film fare with the inevitable final showdown, but Vetrimaaran keeps it interesting by giving his bad guys realistic personalities and reasons to act in the way they do. The fights are short, bloody and more convincing than usual which also avoids sensationalising the gangster element of the story. Although there are a few fights where Prabhu defeats 3 or 4 henchmen, at least it is only 4 rather than 20, and Ravi isn’t a big burly guy either so his fight sequences with Prabhu seem slightly more credible. Apart from the rather Salman Khanesque way Prabhu loses his shirt in the final fight, which is a little OTT but is also a lot of fun too! While the fight scenes work well, the songs are less successful. Although the music by G.V. Prakash Kumar is catchy enough, the picturisation and choreography are generally mediocre and mostly the songs don’t fit well into the narrative. However the rest of the film looks good, at least from what I could see from my poor quality copy, and the strong cast all deliver good performances. 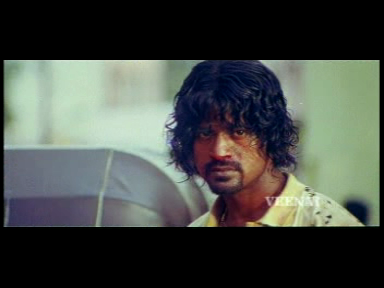 Vetrimaaran’s strengths lie in developing characters with depth and attention to detail in building relationships, and both are used to maximum effect here. The story may not always flow as well as it could but when it comes to the characterisations and the overall plot, everything works perfectly. The screenplay rarely lags and there are enough twists and surprises to keep the film engaging right to the very last frame. While Polladhavan may not be perfect it is a great first film for Vetrimaaran and well worth watching for a gangster film with a difference. 4 stars. This entry was posted in Kollywood and tagged Adventures without subtitles, Bhanupriya, Daniel Balaji, Dhanush, Divya Spandana, Karunas, Kishore, Murali, Pawan, Polladhavan, Ramya, Santhanam, Tamil, Vetrimaaran. Bookmark the permalink. I haven’t watched this one, but I will keep my eyes out for it, or ask my cousin to source a DVD for me. Thanks for the write-up. I think I fell in love with Dhanush the very first time I saw him, which was in the song Engeyo Paartha from Yaaradi Nee Mohini. 🙂 I’ve been a huge fan since then, and he just seems to get better and better. I like that he chooses a mixture of drama and more commercial masala, and manages to succeed at both 🙂 I think that part of his success is that he does look so very ordinary, and that gives him an accessibility other actors don’t seem to have – plus he is a really good actor! Same with the other sites I’ve tried. You can download it, but I haven’t found any with subtitles. The Telugu remake Kurradu does have English subs but the story is somewhat different and includes a series of ‘comedy’ scenes with Ali! I keep hoping they will re-release it with Aadukalam as a double DVD, but not so far – sigh. Maybe if Visaaranai is a big hit we might get a 3-in-1 release 🙂 Ever hopeful! SingingCinema has it on a 2-in-1 DVD with Nayagan but there is no information about the availability of subtitles. Thanks – you are doing a great job of tracking it down! 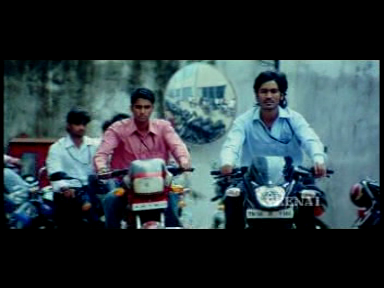 Polladhavan was dhanush’s first complete mass film and it is one of the favourite film for all chennai youth like me.. I really like this film and think it deserves a re-release on DVD! The characterisations are great, and of course Dhanush is as good as always. Even in these early films I think his talent for acting really shines through.